There is currently a lot of conflicting information in the news media over the possibility that two Iranian warships might transit the Suez Canal en route ports in Syria. Syria and Iran are close allies and are signatories to a mutual defense pact. Cooperation between the two countries includes intelligence sharing, joint training, as well as material support of Hizballah in neighboring Lebanon. 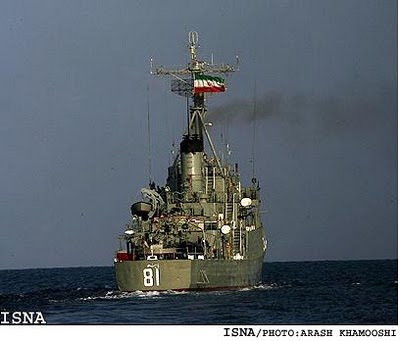 It should come as no surprise that Iranian navy ships would conduct visits to Syrian ports. As soon as word of the planned deployment was made public, senior Israeli military and civilian officials warned that the Iranian move was a provocation, and responed with a thinly-veiled threat that "Israel will know how to deal with it." Here's some friendly advice to my Israeli friends: Yes, deal with it. Of course, your navy should monitor the ships' movements and conduct reconnaissance of them as they move north along the Israeli coast to one of the three Syrian ports with naval facilities: Baniyas, Tartus or Latakia. Photograph them, intercept their electronic emissions and communications, approach within a safe distance, but that's it. As long as they stay 12 nautical miles off your coast, they have every right to be there. For years, the U.S. Navy has conducted what are called "freedom of navigation" operations, known in the Navy as "FONOPS." In FONOPS, American warships sail along coastlines of countries that claim more than the internationally recognized limits of territorial waters, in most cases, 12 nautical miles. We also operate military aircraft in what is international airspace but claimed by other nations - I have participated in some of these operations. We use these operations to assert, claim and demonstrate our right to sail in international waters and to fly in international airspace. There have been confrontations during these operations, most notably with the Libyans. When there have been confrontations, it has not gone well for the Libyans. The U.S. Navy has conducted these operations in the very same waters from which you (Israel) want to restrict movement of these two Iranian warships. Neither we nor you can have it both ways. No one wants hostile foreign warships within sight of their coastal cities, but it is their right to be there. They also have every right to transit the Suez Canal. According to the treaty that governs passage through the canal, all vessels have the right to use the waterway. The governing treaty is the Constantinople Convention of the Suez Canal (1888), which is still in force. Article One of that treaty states, "The Suez Maritime Canal shall always be free and open, in time of war as in time of peace, to every vessel of commerce or of war, without distinction of flag." On a personal note, in 1992, I was the defense attache at an American embassy in a Gulf nation, and remember the brouhaha that ensued when the Iranians used the Suez Canal to take delivery of a Kilo-class diesel-electric attack submarine from the Russians. There was a huge cry of outrage and concern, but under the treaty, they had every right to use the waterway, and did. 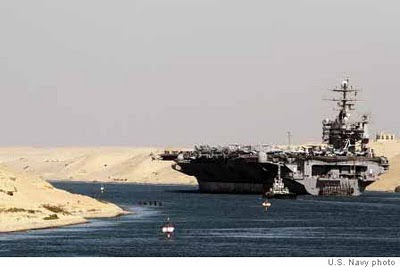 The Egyptian Suez Canal Authority has refused passage for safety reasons, and the Egyptian Ministry of Defense reserves the right to refuse passage to vessels flying the flag of a nation at war with Egypt. While this clause was useful during the time that Egypt and Israel technically remained in a state of war until 1978, the U.S. Navy and the Israeli Navy now often send warships through the canal. Israel has a capable navy, easily the most capable in the eastern Mediterranean. Two Iranian gunboats are not a serious threat to Israel's national security. They will sail up the coast, yes, it will be provocative, and yes, it will be a finger in Israel's eye, but that's the price of living in a world with international laws and norms. Like I said, deal with it. Bahrain - the next domino?